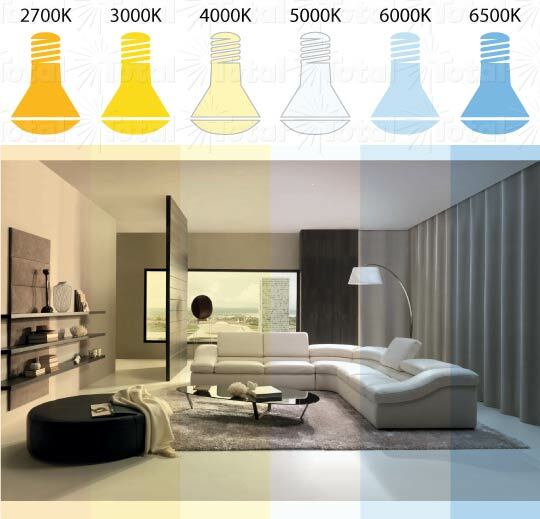 Color temperature plays a very important role in lighting. Every light source emits light that has a warmer or cooler look to it. For example, a candle provides a very warm or orangish looking light that is typically rated at about 1800K, in contrast, many fluorescent bulbs or CFLs tend to have a cooler looking light that are typically rated around 4100K. However, CFL's also come in warmer color temperatures now to simulate what we are all accustom too in the incandescent light sources we have used in our homes for years. As you can see from the image above color temperature can greatly influence the way a space can look. The lower the color temperature, 2700K in this example, the warmer the light looks.. The higher the color temperature, 6500K in this example, the cooler the light looks. You can use the diagram above to help you in choosing the best light source with the right color temperature for your application but please keep in mind that color temperature is just one aspect of choosing the right light bulb. Another very important aspect in lighting is color rendering or how well a light source accurately shows all the colors. It is measured on a scale of 1-100 where 1 is the worst and 100 shows all the colors. This scale is called the Color Rendering Index (CRI).